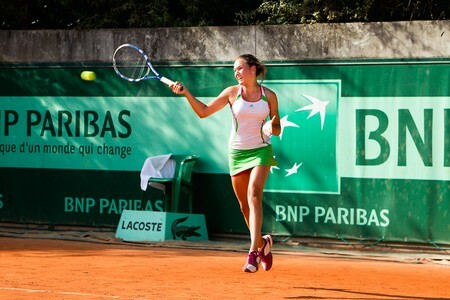 Home croatia tennis vekic Donna Vekic: Future Tennis Superstar? Chiswick, a leafy suburb of London, seems an unlikely place as the setting for the first step on a journey that one girl hopes will end at the top of the ladies tennis game. Particularly when that girl is not even English – in fact she is from Osijek in Croatia. However, when Donna Vekic lifted the title in the $10k tournament last July, it marked the start of her rapid upward progression. Last week, Vekic rose to a career highest ranking of 284 in the world, becoming the youngest player in the top 300 at the tender age of 15. With two career titles to her name at ITF level and an additional five finals, she has made a real impact at the lower levels in her first year. What is even more astonishing is that she has achieved these seven finals in only ten tournaments. Born in Osijeck in June 1996 under the shadow of the Serbian cannons pointed at the city, her family history suggested that she would become an athlete. Her grandmother, a physical education teacher, was credited with discovering one of the city’s most famous exports – the Croatian footballer, Davor Suker – while her grandfather was the head of the youth academy at the Osijek football club. Her mother was a successful national athlete, while her father was a professional footballer. Donna would take up tennis at a relatively early age. After working with a succession of local coaches, she would find herself working with a name familiar to English tennis fans – David Felgate. 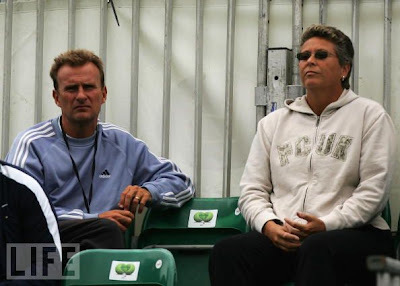 However, over her formative years, the list of coaches who she has received advice reads like a who’s-who of tennis coaching – Sven Groeneveld, Chris Evert and Nick Bolletieri. Her first tentative steps onto the tennis ladder would come in a small, local tournament on the island of Brac. Vekic came through qualifying and would clinch her first ever victory at ITF level, beating the 18-year old Dutch player, Demi Schuurs, who only months before had won the Australian Open Junior doubles tournament. Sadly, in the second round, two match points came and went as she was beaten by the Czech player, Jana Jandova, but more importantly, she had earned her first WTA point and officially had a ranking. The picturesque island of Hvar was her next stop. Victories over Alena Tarasova, Zuzana Zlochova (who had won the tournament the week before), Gracia Radovanovic and Marion Gaud would see Vekic reach her first ever final. She was unable to defeat her opponent, Ema Burgic, but she had developed a taste for success, which she was to build on rapidly in the coming months. This brings up back to Chiswick. In what could almost been seen as her home tournament, given she is based in the area at the Dukes Meadow Club, she impressed the watching locals as she cruised through the field, dropping only one set in the entire tournament. She started with victories over three British girls – Alexandra Walker, Olivia Smith and Jade Windley – to reach the semi-final, before beating the Dutch player, Quirine Lemoine, for the loss of only five games to reach her second consecutive final, where she faced a difficult challenger. The Australian, Bojana Bobusic, ranked inside the top 250 in the world, was the second seed, and had already reached two previous finals in 2011. 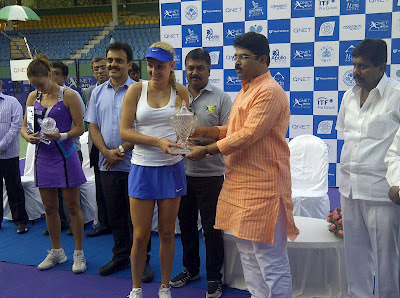 Her experience showed early on, as she took the first set by 6-3. However, the smart and powerful hitting of her opponent, eight years her junior, began to take its toll, and Vekic levelled the match by taking the second set by 6-3. The tide had well and truly turned and it was only a matter of time until Vekic had wrapped up the match, and with it, her first ever title. It was an emotional moment for the young player, falling as it did on the third anniversary of her grandfather’s death, arguably the man who had supported her development in the earliest days. She continued to go from strength to strength. Her next tournament was another $10k competition in Westende-Middlekerke in Belgium in August. She would reach the final of the singles, only losing to the Chinese player, Jing-Jing Lu, while she won the doubles tournament alongside the British player, Alexandra Walker. The next step on her journey was Lagos in Nigeria for a pair of $25k tournaments – the next level up from the $10k tournaments that she had been playing. In the first round, she would beat the sixth seed, Melanie Klaffner, ranked 305, comfortably in straight sets, before seeing off qualifiers, Nidhi Chilumula and Natasha Fourouclas to reach the semi-finals. This would be her biggest test to date as she faced Nina Bratchikova, ranked number 134, and who would go on to reach the third round of the Australian Open earlier this year. In a real shock, Vekic completely outplayed her higher-ranked opponent to won 6-3, 6-2. Unfortunately, the final was one step too far for Vekic, as her run came to an end at the hands of the 2010 French Open Junior champion, Elina Svitolina. The following week saw a series of rematches as Vekic would repeat her impressive victories over Bratchikova and Klaffner, before defeating Dalila Jakupovic in a final-set tiebreak to reach the final. Again, she was unable to clinch the title, although put up a fight against Tamaryn Hendler, the 224th ranked player, before fatigue began to play its part in her tenth match in just fourteen days. However, she had shown that she was perfectly capable of challenging at the $25k level. 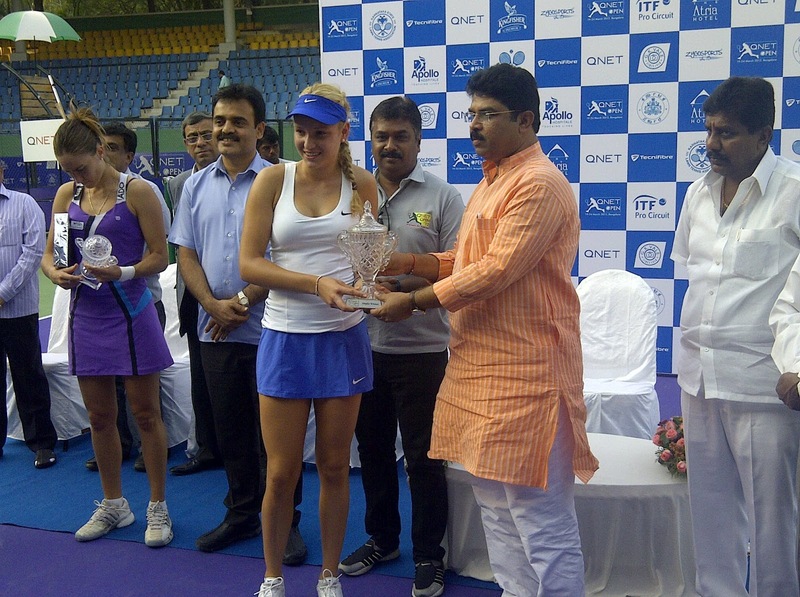 2012 would start slowly with qualifying defeats in Moscow and Kuala Lumpur before she would head to Bangalore. Victories over Curovic and Naydenova would see her into the quarter-final where she faced a prior foe, Tamaryn Hendler, still ranked almost 200 places above her. Vekic would take the first set 6-3 and racing into a 4-0 lead in the second set. However, Hendler’s quality began to show, bringing the scores back level and eventually winning the set on a tiebreak, having broken Vekic when she served for the match. From this point, there seemed only one winner, but Vekic had not read the script. More high-quality attacking play followed and Vekic would finally win the set 6-3 and book her place in the semi-final. A straight-sets victory over the local favourite, Kyra Shroff, in the semi-final would book Vekic a place in the final, where Andrea Koch-Benvenuto, ten years Vekic’s senior, awaited. While the final was hardly a high-quality affair, Vekic would show great maturity, serving well, varying her pace and volleying effectively to clinch an impressive straight-sets victory, and collect the $2,940 cheque and, more importantly, 50 WTA points. Next stop was Namangan, Uzbekistan at the end of April. A high-quality field meant that Vekic was forced into qualifying for the tournament, but that proved no problem as she cruised through her two matches for the loss of only six games. Justyna Jegiolka was dispatched for the loss of only three games in the first round, before victories over the world number 263, Lenka Wienerova, and the world number 234, Monique Adamczak, for the loss of seven games saw her into yet another semi-final. The Ukrainian, Veronika Kapshay, was dispatched with a single break in each set to set up a final with the Russian, Olga Puchkova, ranked 177 and almost 150 places above Vekic. Despite winning the first set 6-3, Vekic was unable to pick up consecutive titles as her higher-ranked opponent showed her experience and superior fitness to win 6-2 in the deciding set. Repeating a fact from earlier, ten tournaments in the past twelve months have seen two titles and an additional five finals. In almost every match in those ten tournaments, she has been playing against players ranked higher than her, and generally at least several years older than her. It is important to remember that she is only 15-years old. When she finishes developing physically, she will be a very dangerous player. It is clear that Donna Vekic has the potential to go far in the ladies game. Whether she has the ability to fulfil her dream and go to the very top of the rankings remains to be seen. However, if her first year on the senior tour is anything to go by, it is surely only a matter of time before she appears in her first WTA tournament, and her first Grand Slam.